This book is not a condensed version of A New Earth. Although it contains some of the most powerful pointers from the original book, there is relatively little here about the ego and nothing about the pain-body. In other words: If you want to understand and thus be able to detect those mental-emotional patterns within you that block the arising of a new consciousness, you have to go to the original book. This book will be of greatest benefit to those who have already read A New Earth —perhaps more than once —responded to it deeply, and experienced some degree of inner transformation through it. The informational content of this book is of relatively little importance. You read it not so much to learn something new, but to go deeper, become more present, awaken out of the stream of incessant and compulsive thinking. If there is no inner recognition, however distant or fleeting, of that to which the words point, then the words will be quite meaningless and remain no more than abstract concepts. If there is such a recognition, however, it means that the awakened consciousness is beginning to emerge from within you and the words you are reading help to draw it out. 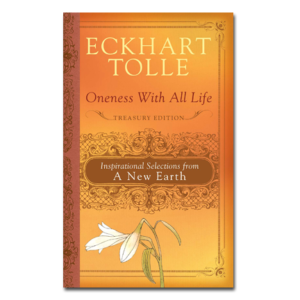 If you come across passages in this book that you feel are powerful, I want you to realize that what you are feeling is your own spiritual power, that is to say who you are in your essence. Only Spirit can recognize Spirit.